LA JOLLA (3-3-16) — The Conquistadors opened the season on the road traveling to La Jolla to take on the Bishop’s Knights in non-league action Wednesday (Mar. 2). Unfortunately they would come on the wrong end of a 9-3 loss. Bishop’s never trailed in the contest as they were able to put up runs in every inning which started with a three spot in the bottom of the first inning. Serra was able to get back into the contest in the top of the second inning as the Conquistadors scored 2 runs to trail 3-2 at the time. Things started off with MEGAN POOLE (2-4, R) ripping a single to left center and ABIGAIL WARDEN (Run) walked. They would both come around to score thanks to RBI singles by SELA FALLON (3-3, RBI) and DARBY TIBBETTS (1-4, RBI). They would add another run in the top of the sixth inning thanks to an RBI single by AMBER WOZNIAK (1-2, RBI) to make the score 7-3. Serra had their opportunities to add more but couldn’t push anything more across despite having the bases loaded. 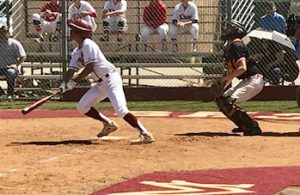 Bishop’s was also able to take advantage of their opportunities by putting runners on in pretty much every inning as they pounded out 12 hits on the day. MONTE VISTA 20, CHULA VISTA LEARNING COMMUNITY CENTER 1 – The Monarchs on opening day traveled down to the South Bay for a Silver Division contest in the Monte Vista Classic to take on the Cobras, Wednesday (Mar. 2). Monte Vista pulled away after the first inning to claim the 20-1 victory in 4 innings. The Monarchs put a 9 spot on the board in the top of the first inning and never looked back in the contest as they did the most of the damage in the first three innings. Sophomore NATALLIA BRAMEILA raked in 4 RBIs on the day as she went 3-4 with a double. On the mound it was CIERRA ROSS who claimed the victory. While only facing 7 batters, she struck out 5 on the day.